The weather is definitely not what I envisioned. Instead of clear blue skies and sunshine, the world is shrouded in fog with dense clouds. But the radar map shows no storms, so I stay the course despite the conditions. If I waited for good weather, I’d miss out on a lot of adventures. My plan is to combine a favorite 50-mile cycle route with friendship, coffee and art. 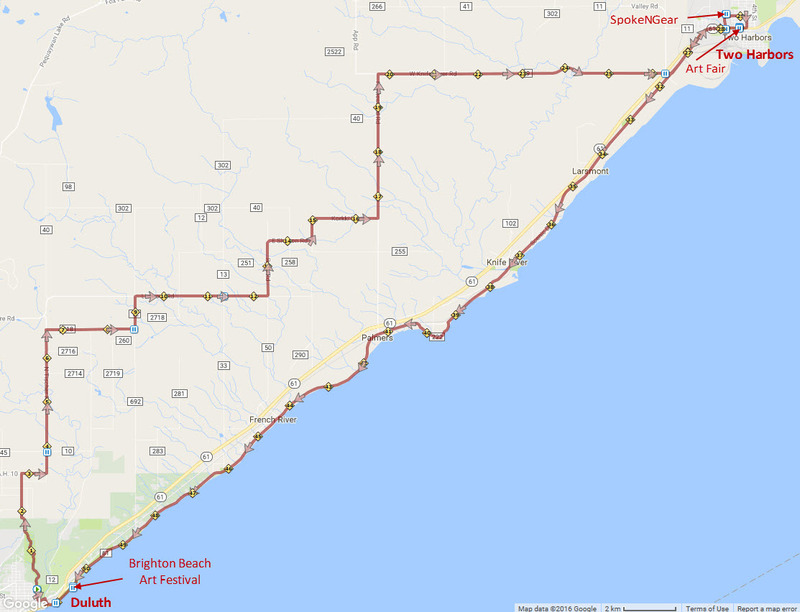 The first leg of my journey is my inland route to Two Harbors. With each turn of my pedals, the air gets wetter and my visibility shrinks. My glasses further obscure my view by collecting mist and drips from my helmet. I eventually abandon them, figuring a bit of blur is preferable to near blindness. But it’s calm, not raining and the temperature is very comfortable for cycling. And I love the quiet of an early morning ride. My first destination is a new combination cyclery/coffee shop, SpokeNGear. Joan is already there waiting for me and within moments, I am convinced that the advance publicity doesn’t do it justice. The modern décor of the coffee shop is uncluttered and inviting, flanked by soaring windows overlooking the woodlands. Anyplace with good scones is a winner in my book, and I can truly taste the lavender in my raspberry and lavender scone that accompanies my latte. An hour passes quickly as we visit in the welcoming space. Before leaving, a staff member from the bike shop graciously tightens some bolts on my bike that the Northland’s bumpy roads had worked loose. Coffee and friendship established, it’s time to move on to art. 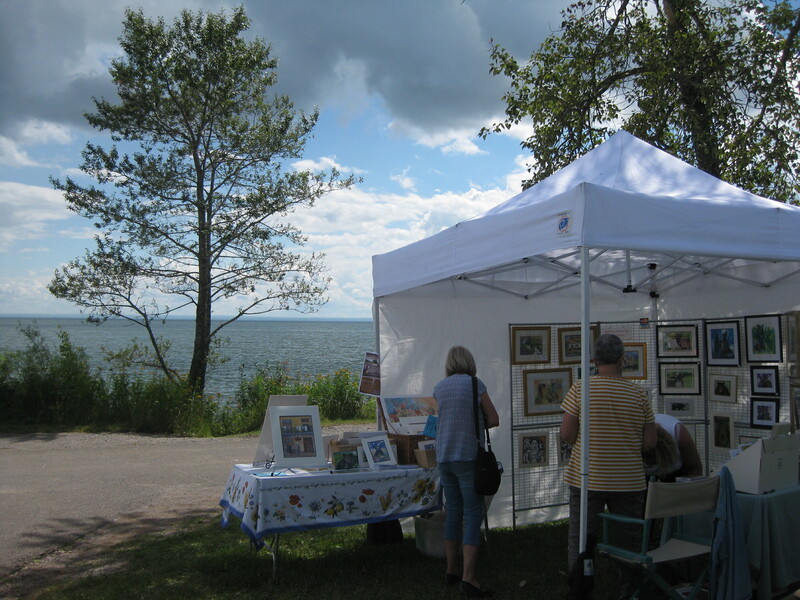 The Art Fair in Two Harbors is sandwiched between local businesses on the main street. 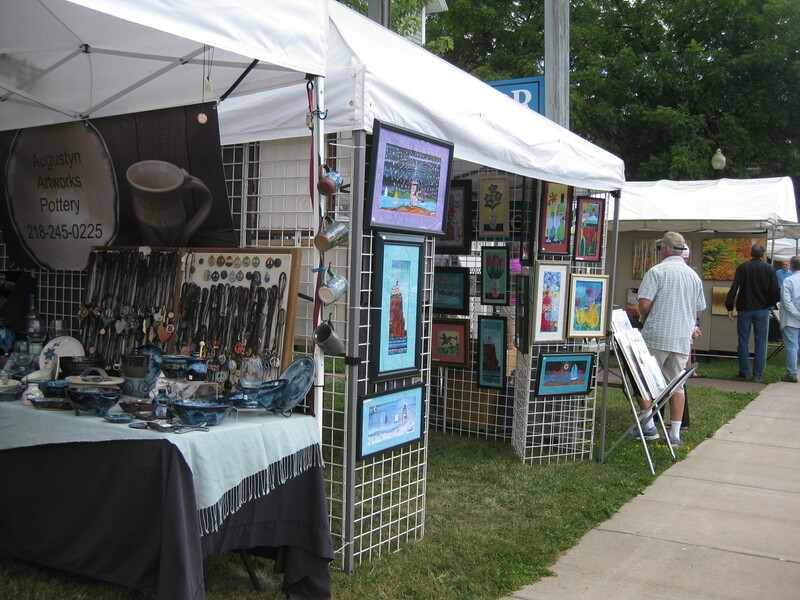 Numerous booths offer a wide variety of crafts and art, and it is always more fun to browse with a friend. We complete our circuit with our wallets in tact, but enriched by the visual displays of talent and each other’s company. Miraculously, by then the gloomy morning has been transformed into the sunny day I visualized. With the sun warming the slight wind off the lake, I fly down the Scenic Highway. 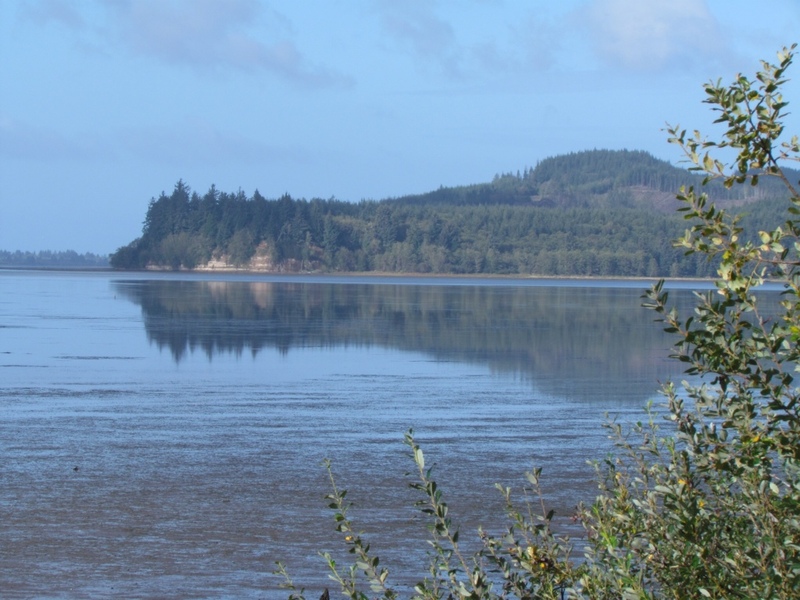 The scenery is classic North Shore with the deep blue lake contrasting against the greenery of the trees and the rugged rocky shoreline. I can’t help but feel the good fortune of living where we are surrounded by such beauty. Just a mile from home and with my odometer already registering 51 miles, I reach Brighton Beach and the Art Festival. There I find booths spread out along the shoreline, featuring 40 selected artists. Having the Big Lake as the backdrop enhances the appeal of the art. It invites lingering, considering, and in my case, yes, buying. It’s a good thing I didn’t cave in to the whims of the weather gods. It’s the sunny part of the day that will stick in my mind. Along with the coffee, the friendship and the beauty of the shore. Art is in the eye of the beholder, and in this case it was picture perfect cycling. We admit it. 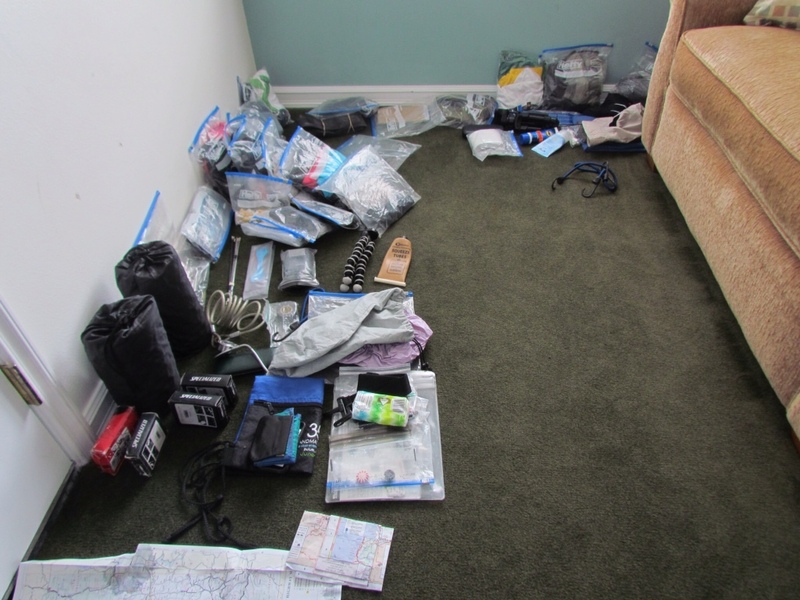 We have to be a bit on the crazy side to go bike touring. Why else would we subject ourselves to the whims of Mother Nature, the hours on a hard saddle, the pick of sleazy motels, and the potluck of unknown restaurants? It takes a true sense of adventure and at times a sense of humor to survive. And yet, we love it. Sometimes the challenges are unforeseen. Take the Chardonnay drought. 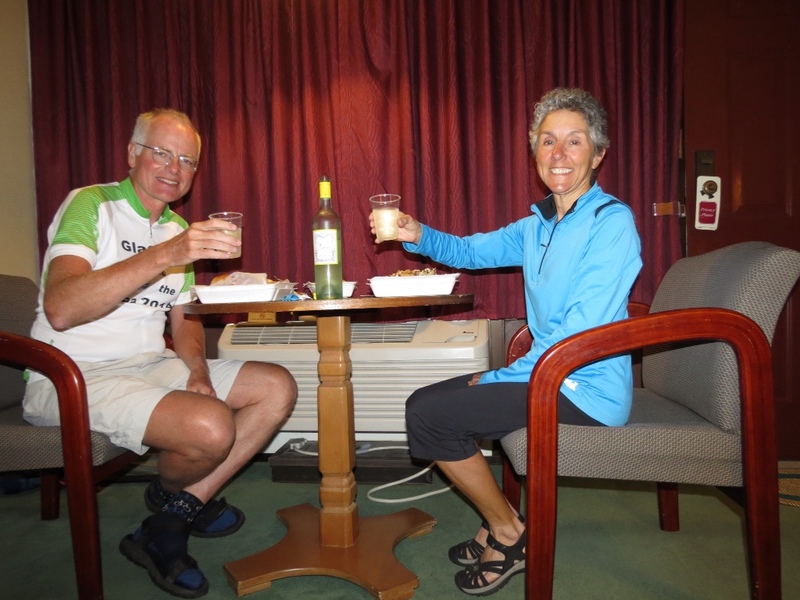 For weeks in Texas, we struggled to get the hang of the whole BYOB thing. Countless times we'd arrive at a restaurant only to find that they didn't serve wine, but we were welcome to bring our own. Off we'd dash to the nearest gas station (yes, you read that right) or other dubious establishment and return with our bottle. Now in Arkansas, it's the dry counties. Forget bringing your own, you can't even buy it. After too many wineless nights, Rich informed me that Ozark, our next destination was not in a dry county. “How do you know?” I inquired. “I searched for liquor stores,” he responded with a grin. If wine is Rich's hang-up, food is mine. I refuse to touch anything from a place with Golden Arches overhead, or other fast food joint. It's tough to keep up my standards when we are reduced to what's within cycling or walking distance. But so far I've managed, even if it means resorting to my stash of bagels and peanutbutter as an alternative. Despite our sharp scrutiny of the available restaurants, we've had our share of mediocre meals. It's especially crushing after a long day of cycling that leaves us famished, when going out to eat is the social highlight of our day. But we survive. I'm also always on the lookout for a good coffeehouse. Fortunately, Rich has learned the value of such establishments for their guaranteed wifi. Now we're both happy. I get my coffee fix and he his internet quota. Today we found a wonderful place called The Coffee Break in Ozark. It's part of the Franklin County Learning Center, employing disabled adults and serving up delicious fresh sandwiches, coffee and baked goods. We already have plans to return for breakfast in the morning. Weather is definitely a factor, every single day. We've become devotees of the weather map showing us what is in store for us, and change our plans on the fly to accommodate it. And yet, it is still unpredictable. Yesterday the possibility of rain was high all day. But we had a lovely sunny afternoon. We love surprises like that. Today we woke up to heavy showers that delayed our start by four hours. But by waiting we stayed dry, even if it meant shortening our distance for the day. And despite all that we cycle on. The discomforts, the longing for a good meal, the raindrops and the squabbles all make for good stories in the end. Perhaps we're a bit crazy. But it's all worth it. I've been craving a coffee stop. The kind where I can sit over a latte, soak in the sun at an outdoor table and savor an unrushed break. 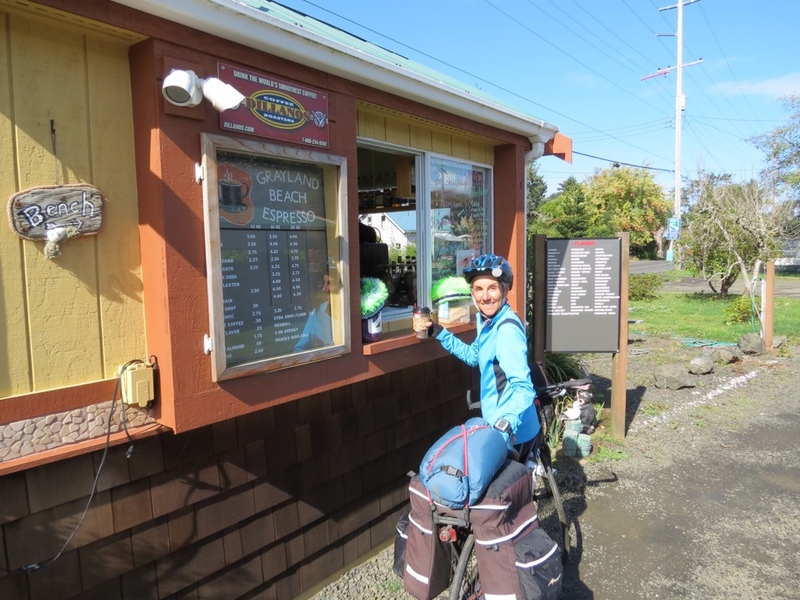 Although the West clearly is serious about its coffee and roadside espresso stands abound as well as coffee houses, they don't always appear at opportune moments in our day's ride. And so I wait. Today I got my wish, but in a backhanded way. 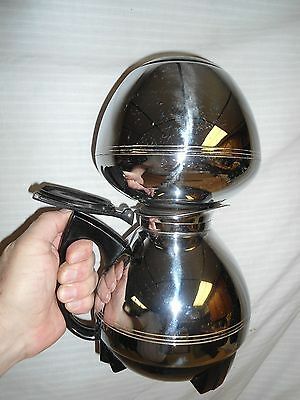 In fact, I'd prefer to have skipped this coffee moment, as it is the result of a bicycle breakdown. While Rich took off in a cab with his bike in the back end, I sit outside a Starbucks watching over the remainder of our gear. And sipping a latte, of course. All things considered, it was a lucky break. 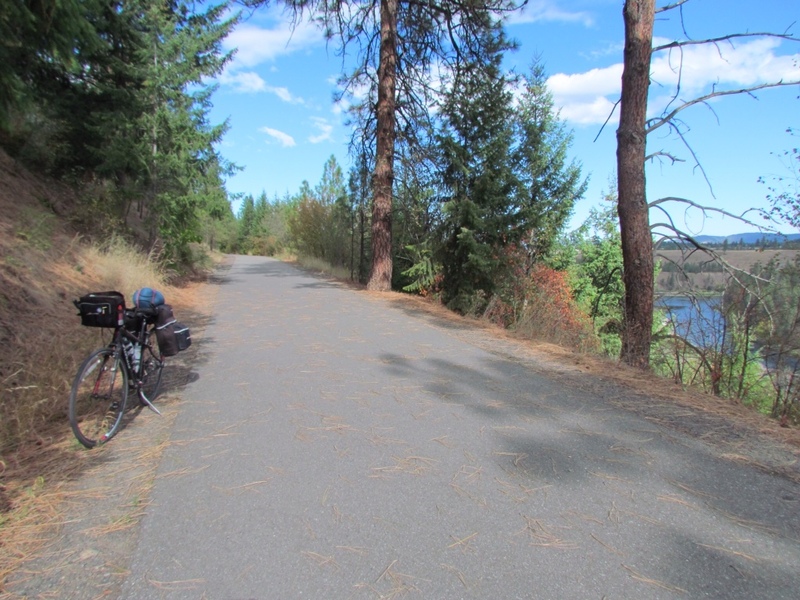 We found a good route out of Spokane which not only avoided traffic but gave us a short but enjoyable run on the Centennial Trail overlooking the Spokane River. 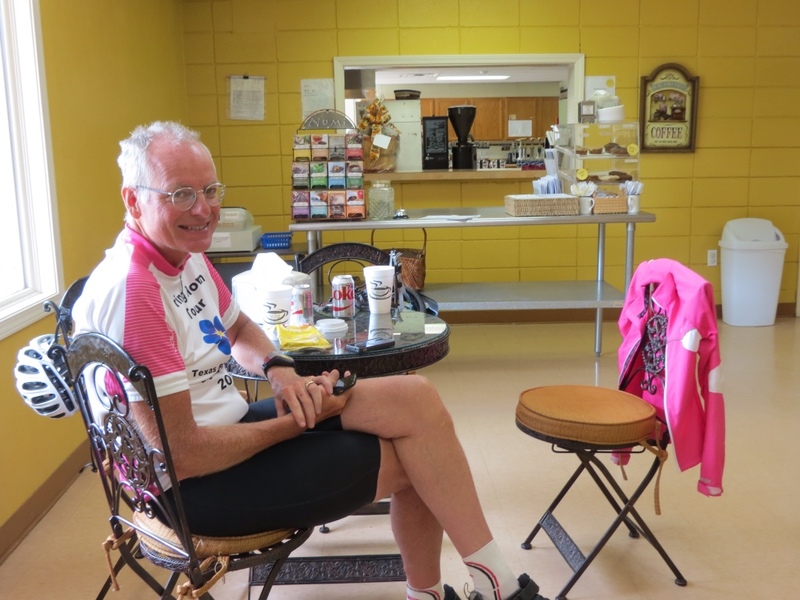 With only 40 miles to cover for the day, we could afford a late start and a leisurely pace. Tooling along west of town, we found ourselves surrounded by flat golden fields with the mountains retreating far into the distance behind us. All was going according to plan until suddenly Rich's bike developed a distinct wobble. A quick assessment revealed a spoke that had broken free of the wheel. It wasn't something he could fix, and with no bike shops in our near future, there was little alternative but to retreat. Back to Spokane. 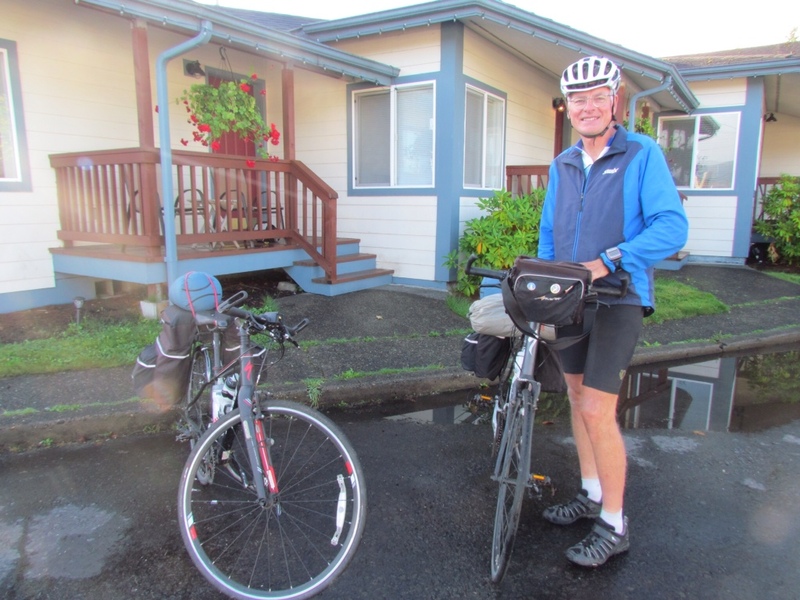 Fortunately, we were only about 10 miles out from the populated airport area, where we could set up camp at Starbucks, call bike shops and set about getting a new wheel. There are a lot worse ways to suffer through a breakdown. We were fortunate to be so close to a major city, with repair shops within reach. And although our arrival will be significantly delayed, we can still make our intended destination. It's just 20 miles farther than we had planned. And even if we don't it won't be a problem. We have no firm commitments at this stage. We just hope we needn't return to Spokane again. The weather gods were certainly shining on us. We awoke this morning to a classic lake effect snowfall that blanketed Duluth, Wisconsin and the UP of Michigan – just what we asked for! We traipsed through several inches of new snow as we loaded the car, and left in the midst of big flakes plummeting down at a rapid pace. Real winter at last, and great start to our XC trip. While the fresh snow erased the barren brown ground and covered the icy remnants of old snow crust, it also meant snowy slippery roads for our travels from Duluth to Ironwood. It felt like relearning winter driving again, especially as the snow plows appeared to be waiting for the snow to stop falling before clearing the roads. Lanes were impossible to see, snow billowed all around us each time a car passed by, and I had a sneaky suspicion it was slippery under all that white stuff. But we forged on, safely thankfully. 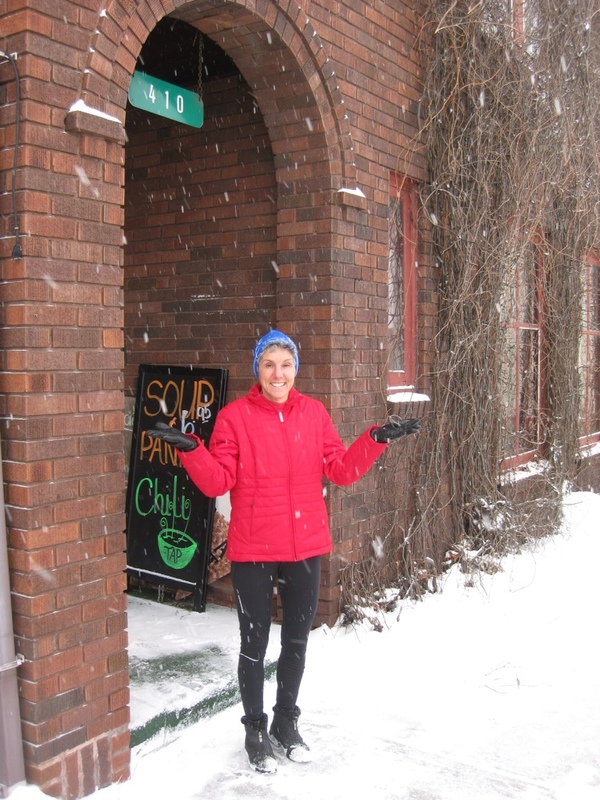 We made our requisite stop at a charming coffee shop en route, where we planned our day’s skiing over coffee and fresh muffins. The proprietor was an enthusiastic foodie, which delighted Susan no end, and on her lead we detoured to the local coop and bakery for hearty breads and baked goods. They would make a good supplement to our evening meal in front of the fire at the B&B, we reasoned. We chose the ABR trails in Ironwood for our day’s ski, figuring they were most likely to be freshly groomed and had plenty of kilometers for us to explore. Groomed they were, but not everywhere. Skate skiers seemed to take precedence, with the classic-only trails yet to be addressed. But we decided that was a benefit, not a hindrance. Some classic trails were skier-tracked, which worked well yet still retained a feeling of remoteness. Classic-only also have the advantage of being narrower, closely lined by trees – our favorite type of trail. Further out, we found trails that were still untouched. We could see the faint outline of the tracks set before the new snowfall, but they were otherwise blanketed in pristine new snow. It was too good to pass up! 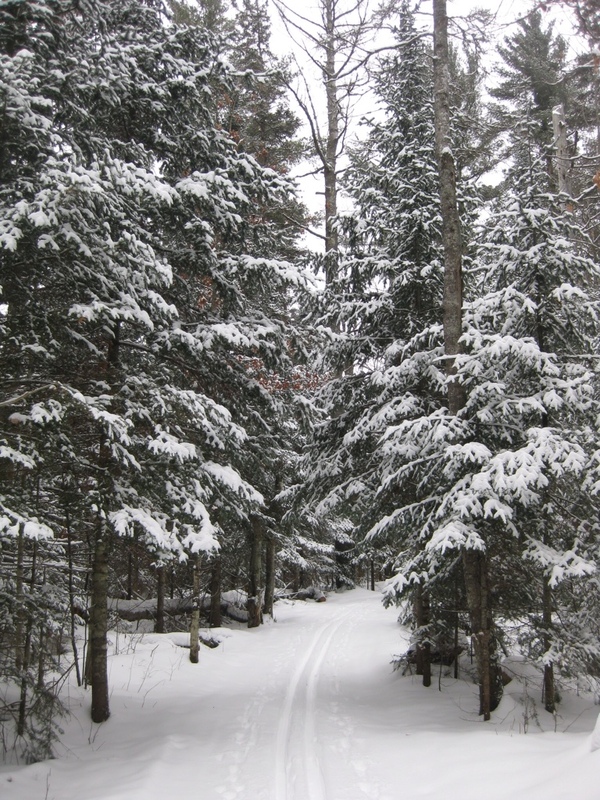 We broke trail and skied through the silent woods for several hours on those trails. No matter that it was slow going – this wasn’t about speed, it was about experience, and it was perfect. Even with 3-4″ fresh powder, there was still enough glide to make it easy going and enjoyable. As each new section of trail beckoned to us, we ventured farther and farther out on the trail system. By the time we neared the trailhead, sunset was long behind us and the light was growing dim. The full parking lot was dotted by only a few remaining cars, and we were tired. But it was a good tired. Thank you, Lake Superior, for another wonderful day of skiing. What’s better than doing a training ride? A ride with a destination! My husband and I have initiated Saturday training rides together, as part of our preparation for our cycling vacation this summer. 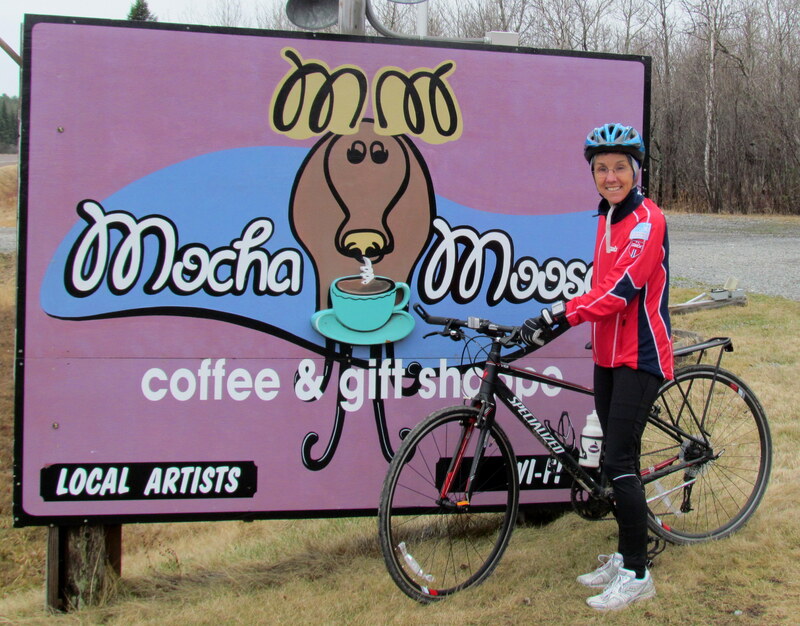 Today we set our sites on Mocha Moose, a funky coffee shop up the North Shore just before Two Harbors. 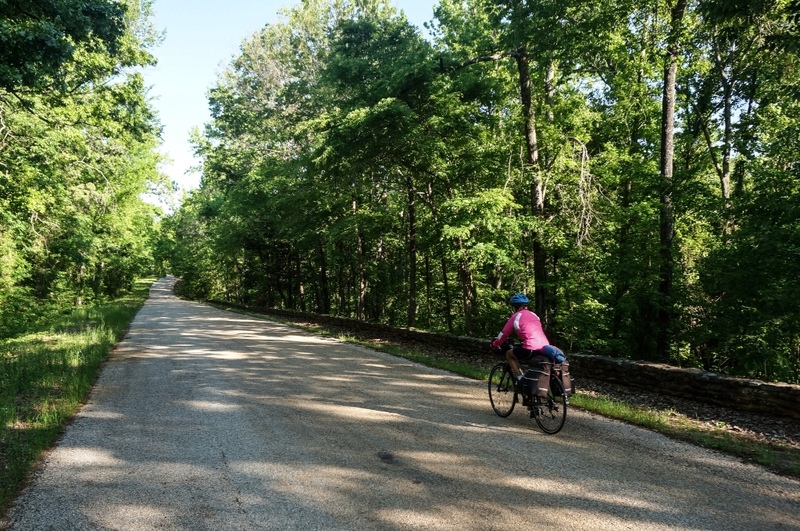 It would make a nice 34 mile ride round trip – not bad for our early season training. Never mind that it was 40 degrees and cloudy. Never mind that there was going to be a headwind on the way back. Never mind that “real athletes” never stop. It was warm and friendly inside Mocha Moose. 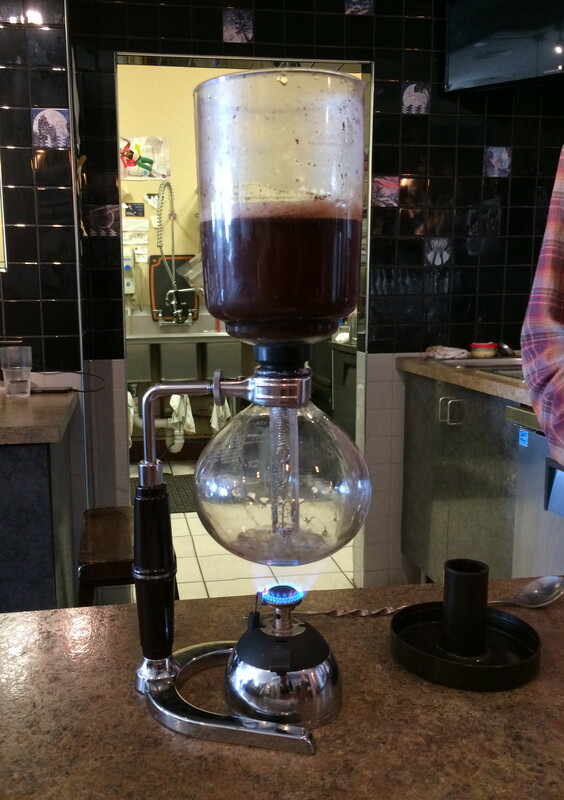 The decor was eclectic, as required fo r a true coffee haven, and the offerings were tempting. Having done our homework, we’d originally set our sites on the sinful cinnamon rolls. But when confronted with the bakery case, it was the breakfast turnovers that called to us – layers of flaky pastry surrounding ham, cheese and egg. We’ve earned these, right? Owner Patti lived up to her vivacious reputation, and kept us entertained while we lingered. 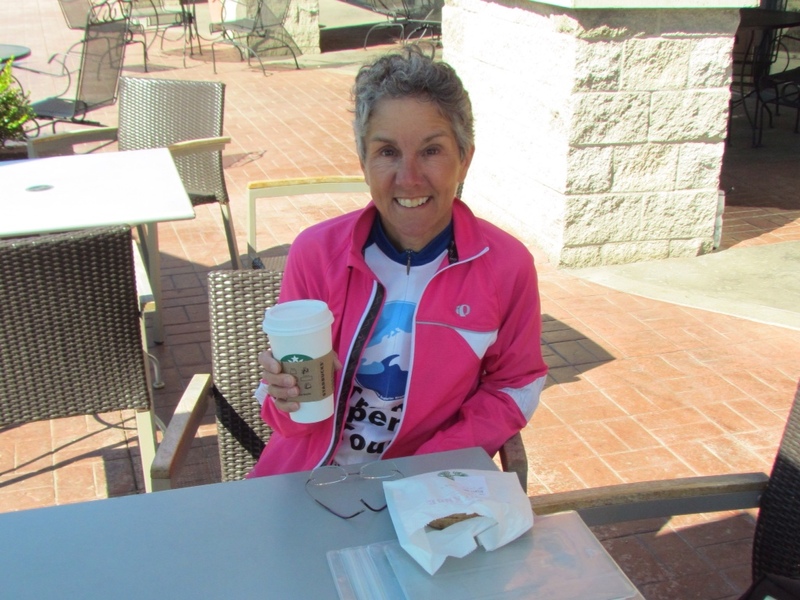 She was a bountiful source of local flavor, including tales of other cyclists who are regulars at her place. 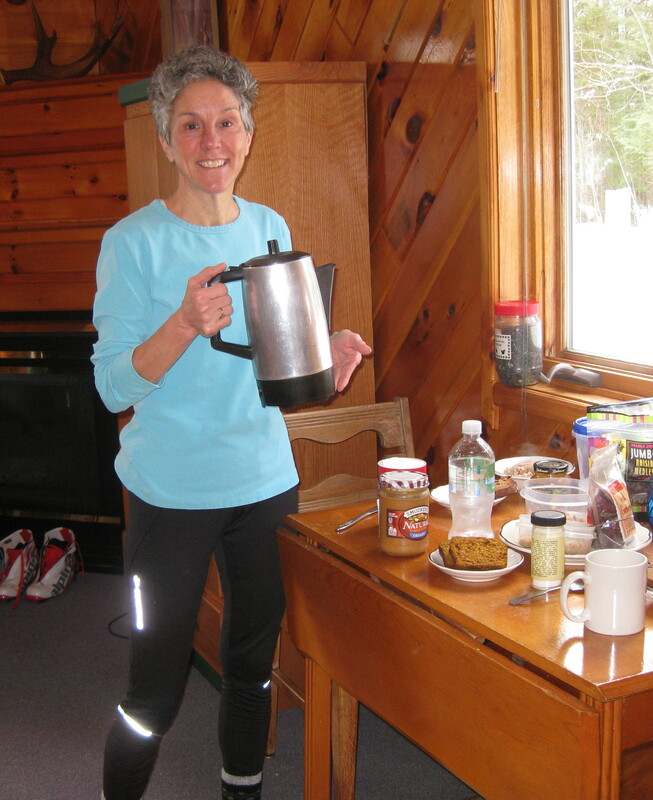 And she was just as easily absorbed in the details for our upcoming cycling trip, which will pass by her door. We just might have to make it a stop on our tour!